FACT-FILLED BACKGROUNDER highlights moves by Dems and even GOPers. By Wednesday, John Brennan, US President Barack Obama's assistant for homeland security and counterterrorism made a quick trip to Israel to discuss Hezbollah's massacre of Israeli tourists in Burgas, Bulgaria last week. Hopefully it was an instructive meeting for the senior US official, although his Israeli interlocutors were undoubtedly dumbstruck by how difficult it was to communicate with him. Unlike previous US counterterror officials, Brennan does not share Israel's understanding of Middle Eastern terrorism. Brennan's outlook on this subject was revealed in a speech he gave two years ago in Washington. In that speech Brennan spoke dreamily about Hezbollah. As he put it, "Hezbollah is a very interesting organization." He claimed it had evolved from a "purely terrorist organization" to a militia and then into an organization with members in Lebanon's parliament and serving in Lebanon's cabinet. Brennan continued, "There is certainly the elements of Hezbollah that are truly a concern for us what they're doing. And what we need to do is find ways to diminish their influence within the organization and to try to build up the more moderate elements." Perhaps in a bid to build up those "moderate elements," in the same address, Brennan referred to Israel's capital city Jerusalem as "al Quds," the name preferred by Hezbollah and its Iranian overlords. Brennan's amazing characterization of Hezbollah's hostile takeover of the Lebanese government as proof that the terrorist group was moderating was of a piece with the Obama administration's view of Islamic jihadists generally. If there are "moderate elements," in Hezbollah, from the perspective of the Obama administration, Hezbollah's Sunni jihadist counterpart the Muslim Brotherhood is downright friendly. On February 10, 2011, Obama's Director of National Intelligence James Clapper made this position clear in testimony before the House Select Committee on Intelligence. Clapper's testimony was given the day before then Egyptian president and longtime US ally Hosni Mubarak was forced to resign from office. Mubarak's coerced resignation owed largely to the Obama administration's decision to end US support for his regime and openly demand his immediate abdication of power. As Israel warned, Mubarak's ouster paved the way for the Muslim Brotherhood's ascendance to power in Egypt. In his testimony Clapper said, "The term 'Muslim Brotherhood' is an umbrella term for a variety of movements. In the case of Egypt, a very heterogeneous group, largely secular which has eschewed violence and has decried al Qaida as a perversion of Islam. They have pursued social ends, betterment of the political order in Egypt, etc." Watching Clapper's testimony in Israel, the sense across the political spectrum, shared by experts and casual observers alike was that the US had taken leave of its senses. The slogan of the Muslim Brotherhood is "Allah is our objective; the Prophet is our leader; the Quran is our law; Jihad is our way; dying in the path of Allah is our highest hope." How could such a high level US official claim that such an organization is "largely secular"? Every day Muslim Brotherhood leaders call for the violent annihilation of Israel. And those calls are often combined with calls for jihad against the US. For instance, in a sermon from October 2010, Muslim Brotherhood head Mohammed Badie called for jihad against the US. As he put it "Resistance [i.e. terrorism] is the only solution against the Zio-American arrogance and tyranny, and all we need is for the Arab and Muslim peoples to stand behind it and support it." Badie then promised his congregants that the death of America was nigh. As he put it, "A nation that does not champion moral and human values cannot lead humanity, and its wealth will not avail it once Allah has had His say, as happened with [powerful] nations in the past. The US is now experiencing the beginning of its end, and is heading towards its demise..."
Brennan's and Clapper's obliviousness to the essential nature of Hezbollah and the Muslim Brotherhood are symptoms of the overarching ignorance informing the Obama administration's approach to Middle Eastern realities. Take for instance the Obama administration's policy confusion over Syria. This week the Washington Post reported that the Obama administration lacks any real knowledge of the nature of the opposition forces fighting to overthrow the Syrian regime. Whereas one senior official told the paper, "We're identifying the key leaders, and there are a lot of them. We are in touch with them and we stay in touch," another official said that is not the case. As the latter official put it, "The folks that have been identified have been identified through Turkey and Jordan. It's not because of who we know. It's all through liaison." The fact that the US government is flying blind as Syria spins out of control is rendered all the more egregious when you recognize that this was not inevitable. America's ignorance is self-inflicted. In the 16 months that have passed since the Syrian civil war broke out, the administration passed up several opportunities to develop its own ties to the opposition and even to shape its agenda. Two examples suffice to make this clear. First, in October 2011, according to the Beirut-based Arabic news portal al Nashra, Dalia Mogahed, Obama's advisor on Muslim affairs blocked a delegation of Middle Eastern Christians led by Lebanon's Maronite Patriarch Bechara Rai from meeting with Obama and members of his national security team at the White House. According to al Nashra, Mogahed cancelled the meeting at the request of the Muslim Brotherhood in her native Egypt. The White House cancelled the meeting days after Rai visited with then French president Nicolas Sarkozy in Paris. During that meeting Rai angered the French Foreign Ministry when he warned that it would be a disaster for Syria's Christian minority, and for Christians throughout the region if the regime of Syrian President Bashar Assad is overthrown. Rai based this claim on his assessment that Assad would be replaced by a Muslim Brotherhood-dominated Islamist regime. And nine months later it is obvious that he was right. With Syria's civil war still raging throughout the country, the world media is rife with reports about Syria's Christians fleeing their towns and villages en masse as Islamists from the Syrian opposition target them with death, extortion and kidnapping. Then there are the US's peculiar choices regarding the opposition figures it favors. Last August, in a bid to gain familiarity with the Syrian opposition, Secretary of State Hillary Clinton met with opposition representatives at the State Department. Herb London from the Hudson Institute reported at the time that the group Clinton met with was dominated by the Muslim Brotherhood. Members of the non-Islamist, pro-Western Syrian Democracy Council compose of Syrian Kurds, Alawites, Christians, Druse, Assyrians and non-Islamist Sunnis were not invited to the meeting. Clinton did reportedly agree to meet with representatives of the council separately. But unlike the press carnival at her meeting with the Muslim Brotherhood members, Clinton refused to publicize her meeting with the non-Islamist opposition leaders. In so acting, she denied these would-be US allies the ability to claim that they enjoyed the support of the US government. The question is why? Why is the Obama administration shunning potential allies and empowering enemies? Why has the administration gotten it wrong everywhere? In an attempt to get to the bottom of this, and perhaps to cause the administration to rethink its policies, a group of US lawmakers, members of the House Intelligence and Judiciary Committees led by Rep. Michele Bachmann sent letters to the Inspectors General of the State, Homeland Security, Defense, and Justice Departments as well as to the Inspector General of the Office of the Director of National Intelligence. In those letters, Bachmann and her colleagues asked the Inspectors General to investigate possible penetration of the US government by Muslim Brotherhood operatives. In their letters, and in a subsequent explanatory letter to US Rep. Keith Ellison from Rep. Bachmann, the lawmakers made clear that when they spoke of governmental penetration, they were referring to the central role that Muslim groups, identified by the US government in Federal Court as Muslim Brotherhood front organizations play in shaping the Obama administration's perception of and policies towards the Muslim Brotherhood and its allied movements in the US and throughout the world. That these front groups, including the unindicted terror funding co-conspirators, the Council on American-Islamic Relations, (CAIR), and the Islamic Society of North America, (ISNA), play a key role in shaping the Obama administration's agenda is beyond dispute. Senior administration officials including Dalia Mogahed have close ties to these groups. There is an ample body of evidence that suggests that the administration's decision to side with the hostile Muslim Brotherhood against its allies owes to a significant degree to the influence these Muslim Brotherhood front groups and their operatives wield in the Obama administration. To take just one example, last October the Obama administration agreed to purge training materials used by US intelligence and law enforcement agencies and eliminate all materials that contained references to Islam that US Muslims groups associated with the Muslim Brotherhood had claimed were offensive. The administration has also fired counterterrorism trainers and lecturers employed by US security agencies and defense academies that taught their pupils about the doctrines of jihadist Islam. 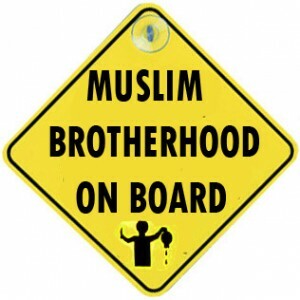 The administration also appointed representatives of Muslim Brotherhood aligned US Muslim groups to oversee the approval of training materials about Islam for US federal agencies.